Find out more about how you can get involved and help make a difference. Earthwatch conducts scientific research in four areas in response to environmental challenges: Wildlife and Ecosystems, Ocean Health, Climate Change, and Archaeology and Culture. Here’s a sampling of ways we’ve made a difference over the years. 2011: Costa Rica – Earthwatch research demonstrates that farmers can increase coffee yields by up to 25 percent by reducing the use of fertilizers and reducing soil acidity – creating financial returns of up to $1,200 for farmers and improved environmental outcomes. 2008: Ikh Nart Nature Reserve, Mongolia – Designated an Important Bird Area of Mongolia, this area now protects cinereous vulture and golden eagle nesting sites. In 2009, it became a model for other national protected areas. 1995: Moreton Bay, Australia – Earthwatch volunteers monitoring shorebird habitat needs and migration are instrumental in the bay’s designation as a Ramsar Wetland of International Importance. 2011: Matura, Trinidad and Tobago – Years of work by Matura Earthwatch partner Nature Seekers, informed by data collected by Earthwatchers, culminate in a ban on turtle harvesting from all coastal waters. 2006: Alboran Sea, Spain – Busy shipping lanes are diverted after Earthwatch data connecting acoustic and water pollution with a decline in common dolphin numbers are presented to the International Maritime Organization. 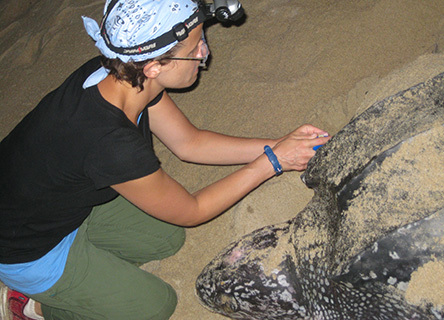 1984: Sandy Point, St. Croix, U.S. Virgin Islands – The area is designated a national wildlife refuge by the U.S. government thanks to the work of Earthwatch volunteers to eliminate poaching of leatherback turtle nests and rescue hatchlings. 2013: Kenya – Earthwatch scientists launch Africa’s first community-based mangrove conservation and development project funded by carbon credits. 2011: Western Ghats, India – Data collected by HSBC Climate Champions are submitted to government officials, who include them in a report to the U.N. Framework Convention on Climate Change. 2007–2008: Churchill, Manitoba, Canada – Protocols for snow measurement developed on an Earthwatch climate change project become the international scientific standard. 2010: Earthwatch teams discover a 2,000-year-old dog burial at Ban Non Wat, Thailand. The skeleton provides new evidence on the relationship between the area’s prehistoric people and their environment. 2001: Ischigualasto Valley, Argentina – The area is named a UNESCO World Heritage Site thanks to Earthwatch work on fossil beds containing the world’s earliest dinosaurs. 1991: Rehoboth, Namibia – Earthwatch scientists and volunteers find so much evidence of prehistoric Namibian culture that the Rehoboth Museum is built to house it. Protect some of the world’s most important sea turtle nesting beaches and the fascinating reptiles that depend on them. Play an active role in designing an ongoing archaeological investigation in the remote and beautiful Mongolian steppe. Read more. Learning about sustainable practices and quality coffee. Starbucks is helping research relationships between sustainable farming practices and quality coffee, while collecting data on soil acidity and plant productivity. Read more.